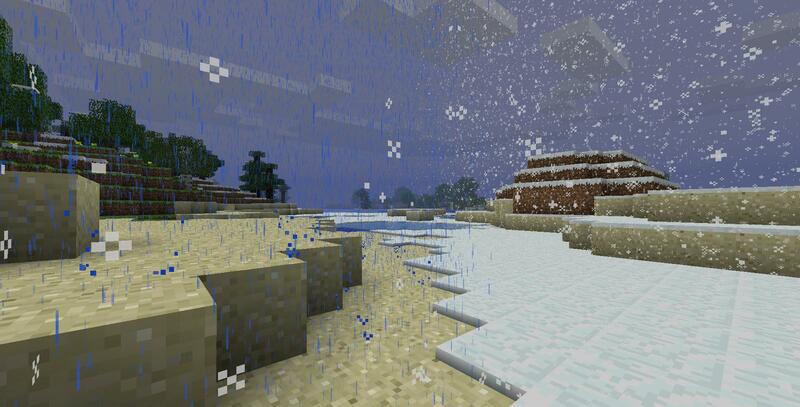 Notch has said on his Twitter that he's going to add rain, snow, thunder and storms in the next update. He says while it's raining wolves will get wet and fires will be put out. "Adding rain and snow to 1.5." "Ice and snow will regrow, farms will autowater"
"Ok, so it doesn't look GREAT on the border of two biomes.. http://i.imgur.com/UVNCC.jpg"
"Wolves get wet in the rain. Crops will get watered. Anything else it should affect?" "I'm not making it solidify lava, as that would ruin all surface lava structures when the first rain hits. But it does put out fires." "Higher odds of catching fish while raining.. Good one. :biggrin.gif: I'll try making it fill small holes with water, but it might be annoying.. brb"
"You can't see sun/moon/stars while it's raining, and days are one level darker." "I'm getting so carried away with this weather.. Adding thunder now." "Here's a crazy idea.. How about having weapons deal +1 damage if the player is moving downwards when you attack?" Did he say this would be smp compatible? All I have to say is: whoa. The weather looks pretty good, plus all the little effects it has. Awesome, infinite snow is coming back! Although I will be disappointed if Slime Blocks are not added before 2.0. No one said snow was infinite yet. Need your server status on your website? Check out mcapi.us! Of course it will be its a update not a mod. It just might not be at first because of bugs or something. A wild Rick Astley has appeared! Rick Astley uses rick roll! The nether is a bit different. I think the problem is that everyone has to go there and notch cant do that or something. But the nether does work on multiplayer you just have to have a plugin. I have a feeling all the people complaining about lack of updates and features will suddenly shut up when 1.5 comes out. If only. Unfortunately, they won't. THey will complain about "OMGWTFBBQ NOTCH YOU A-HOLE! NOW MY MINECRAFT HAS THUNDER THAT BREAKS MY BLOCK! YOU SUXORZZZZ!" or, they will say "NOW MINECRAFT MAKES RAIN THAT LOOKS ULGY AND MAKES SLOW! I HATE YOUUUUUU!!!! and other crappy complaints like that. Here is a message to you: IF YOU DON'T WANT MINECRAFT TO LAG, GET A GOOD COMPUTER! RAM= POWER! GOOD PROCESSOR = POWER! notch cant do it but the plugin can? how is that an excuse? On-topic, I hope we get snowballs from removing snow with water again. snowfarms were the best thing ever. also, i hope the rain does not fill up small holes with water. just as he said, that would be damn annoying. I think a possibility would be to make it a 'special' water, that disappears after half an ingameday or something. updating in general, i am happy they are working faster now. You underestimate whiners. I can hear them already: "The weather is lagging the game, doesn't add that much anyway and makes it hard to see! Change it back already!" Never minding, of course, that minecraft ALWAYS lags a little bit regardless of graphics. I say just ignore the whiners and enjoy the upcoming eye candy. I'd be glad to see "rain" and non-spring "water" blocks from rain. From there it is a smaller step to non infinite pools, waterfalls that descend vertically as "rain" instead of pure "water" if the flow isn't strong enough, etc. Whiners demand crap and when they get it they whine even more. What's the 'piston mod' he mentions on his blog? Weather really isn't that game changing. What about AI that is better than walking straight ahead, or those new game modes, or the goblin villages he promised about a year ago? 1.) Weather is quite game changing, because it allows the ability to get more snow, as well as the possibility of floods if finite water is re-added along with rain. Also, thunderstorms may cause forest fires and break blocks. 2.) AI is hard to make better on a randomly generated world. The mobs would have to be decreased in number to be allowed to have better pathfinding, or else the lag would be enormous. Instead, make zombies dig blocks when they try to get to you. 3.) I don't think he promised goblin villages. He mentioned them, but never promised. Again, it also comes back to the AI issue. Are you aware of how incredibly difficult it would be to make a good village AI? Sorry for the caps, but finally snow will have a strategic advantage again, stealth snow landmines ftw! I post in green, no idea why.